* 108 is the number of the Upanishads, sacred treatises comprising Vedic texts with some of the central philosophical concepts of Hinduism. * 108 is the number of beads on a Tibetan mala (prayer beads, analogous to a rosary). * 108 is two times fifty-four, which is the number of sounds in Sanskrit (an ancient language of India). * 108 is six times eighteen, which is a Jewish good luck number. Below is a video of 36 Half Salutations that I recorded at the UC Berkeley campus. See, you don’t need a mat. You can even do it barefoot, and in regular clothes. You get the idea, you can do these anytime, anywhere. In this video, I guide you through 36 half salutations, which you can do three times to add up to 108, or you can do it once as a warm-up for the next two rounds of 36 sun salutations. When walking the Camino, I would start each day with a few rounds of half salutations to warm my body up, and I truly believe that they helped prevent injuries. Exhale and bend your knees slightly, folding forward with your back straight, lowering your hands to touch the ground on either side of your feet (Forward Fold Position). Inhale halfway up, chest forward. Look forward. Exhale and lower your head back to forward fold. Inhale with a straight back, slowly bringing your arms up above your head. Exhale and return to the starting position (Mountain Pose). Adho Mukha Svanasana (downward dog), and Urdhva Mukha Svanasana (upward facing dog). You will definitely work up a sweat and feel every muscle in your body lengthened and strengthened. Have water nearby, and pause the video if you need to take a break. Remember to let each inhale and exhale guide every movement so it becomes a moving meditation. Ready to move on? For this last set of 36 Sun Salutations, I have added a variety of poses. While most of these aren’t traditional sun salutations, they are linked together in the style of salutations. Some favorite standing poses are included, such as Warriors 1 & 2, Triangle, Side Angle, Pyramid, Revolved Side Angle, and Pigeon pose near the end. Always remember to match the breath with every movement to keep it flowing. Go at your own pace, take a break if needed, and have water nearby. 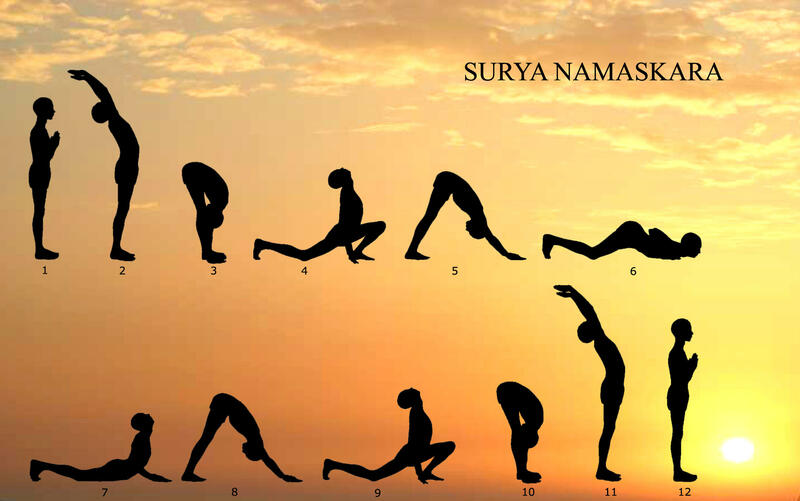 If you are a purist and prefer to just do 108 of the classic Surya Namaskar, the steps are below. I just wanted to offer three levels of intensity— starting with half, then full, and rounding it out with a variety of my favorite yoga pose— to provide a more thorough workout. Come to a relaxed standing position, with your arms at your sides and your feet together. Breathe deeply through the nose and match each breath with a movement, per the 12 steps below. When ready, bring your palms together at your chest, thumbs resting against the sternum (Mountain Pose). Exhale. Inhale and stretch your arms above your head, shoulders back and pelvis forward (slight backward bend in your spine) (Forward Salute Pose). Exhale and bend your knees slightly, folding forward with your back straight, lowering your hands to touch the mat on either side of your feet (Forward Fold Pose). In pause between breaths, move your left foot back, both knees on the floor (or into Plank Pose). Exhale and lower your chest and nose to the mat (Chaturanga Dandasana or Four-Limbed Staff Pose). Inhale and lower pelvis while pushing the chest up, arms straight and shoulders back (Cobra Pose). Exhale and raise your tailbone, straightening your arms and legs, pushing your chest toward your thighs and your heels toward the ground (Downward-Facing Dog).